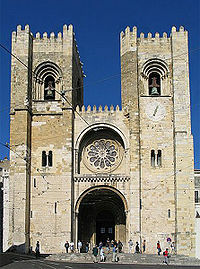 Portugal: Lisbon - The Fascinating City Lisbon has a great atmosphere! The people are wonderful and the lifestyle is very laid back. There is so much to see here you will never get bored. I love Portugal. Not only for the gorgeous sandy beaches, inspirational art galleries and architecture, but also for the best coffee and cake I have ever tasted. I'm lucky enough to have a Portuguese friend who showed us around Lisbon when we went on a five day last minute trip. Lisbon is completely different to the UK. It took us a day or so to get used to the way of life here, but once we did, we quickly became accustomed to how people live and really enjoyed it. Portugal is famous for it's signature cake "Nata" which is believed to have been created before the 18th Century by Catholic Sisters at Jerónimos Monastery, which is a gorgeous parish to admire in Belém. Here is the oldest Nata café which opened in 1837 and has hundreds of visitors every day. I was curious so I asked the waiter how many they sell in a day, his reply, "about 250,000 during peak holiday times and 50,000 during the quieter months." You should have seen our faces! Also located here is the National Archeology Museum which has finds from all over the country. Just across the road is the Cultural Center and when we went there was a wonderful art/design show on throughout. We really enjoyed ourselves. As we walked out of the center. We saw the Padrão dos Descobrimentos (Monument to the Discoveries) which celebrates the Portuguese who took part in the Age of Discovery in the 15th and 16th Centuries. 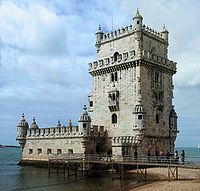 It is built on the estuary of the river Tagus, where ships departed to embark on their journeys. It's attention to detail was amazing as people had been carved out of concrete. There were so many restaurants to choose from in the evening, it took us all about an hour decide what we wanted to eat. Eventually, we decided on a little café and it was such a good choice. The chips were made from fresh potatoes rather than frozen from a packet (this is actually true in all of Portugal) and we had a selection of things to share, Tosta Mista (Ham and Cheese Toastie), Tomato Soup, Chicken and Beef. It was all wonderful and at a fairly cheap price too. Belém will easily take up a whole day as there is so much to see and enjoy. It's very relaxed and everyone was so friendly to us and laughed when we pronounced things wrong. But overall, a great time was had! Auto Europe are offering great deals on Portugal Car Hire so why not plan a last minute holiday and go eat some cake?